The shooting at the Republican baseball team practice Wednesday morning left Washington lawmakers stunned and saddened. But they decided it won’t stop Thursday night’s Congressional Baseball Game, an annual bipartisan charity event at Nationals Park. At a news conference Wednesday afternoon, Rep. Joe Barton (R-Texas), the Republican team manager who was at the morning practice with his 10-year-old son (he hid under an SUV during the gunfire), said, “We’re united as United States representatives.” The shooting that wounded five people, including House Majority Whip Steve Scalise (R-Louisiana), would not crush their spirit. And that included a little competitive jawing. Barton joked that since Scalise wouldn’t be playing, it would be only fair if Rep. Cedric Richmond (D-Louisiana) sat out as well. But that would really be too much to ask. Richmond, the Democrats’ star pitcher and chairman of the Congressional Black Caucus, is likely the best player to ever play in the congressional game. Richmond tweeted that he was “saddened by the horrific news from GOP baseball practice.” Later he went to the hospital to see Scalise, who was in critical condition Wednesday night. But the game will go on, televised on C-SPAN beginning at 7:05 p.m., and Richmond is likely to be a star to watch. Last week at baseball practice, the 43-year-old former college player was looking forward to the contest against his colleagues across the aisle. It was shortly before 8 a.m. when the Democrats were taking batting practice at a field in Washington, D.C., and Richmond — aka “Franchise” — stepped to the plate. “We need a right fielder,” Doyle called out. “I won’t hit it that way,” Richmond said, which meant either he’s a pull hitter or he knows how to put the ball where his team needs it to go. His swing was smooth and level, repeatedly sending line drives into the outfield. One laser shot went to deep left-center, and freshman Rep. Tom Suozzi (D-New York) made a stabbing catch to the cheers of his teammates. But on the very next pitch, Richmond launched a shot directly back at Suozzi, who barely had time to react as the ball sailed over his head. The congressman stepped out of the batter’s box and removed his helmet. “We don’t need any heroes out there making catches like that,” Franchise said. 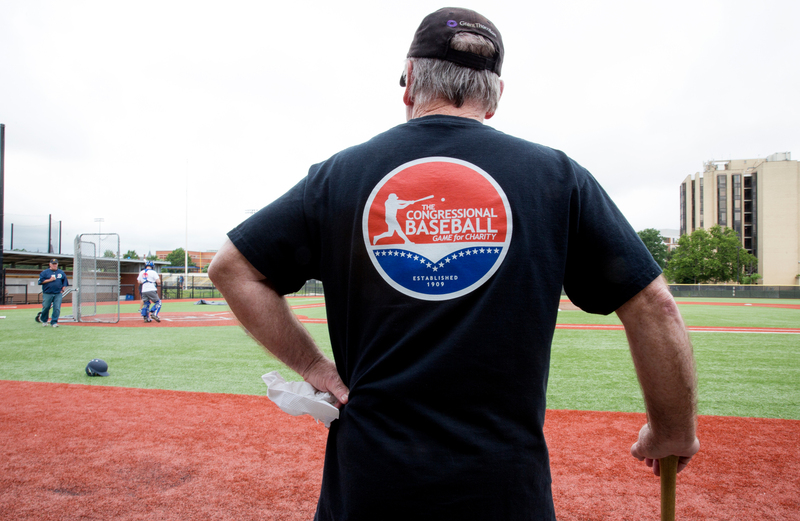 Coach Joe Foley shows off his T-shirt before practice at the Congressional Baseball League. The Congressional Baseball Game, which began in 1909, benefits the Boys & Girls Clubs of Greater Washington, the Washington Nationals Dream Foundation and the Washington Literacy Center. After Wednesday’s shooting, the Fallen Officers Fund was added. Richmond, a starting pitcher since 2011, left in the seventh inning last year — he was recovering from shoulder surgery the year before and also from spending the night on the House floor as part of a Democratic protest of Republican refusal to vote on a gun control measure. The Democrats lost, 8-7, snapping a seven-year winning streak. The New York Times once dubbed Richmond “The Babe Ruth of Congress.” The Eastern New Orleans native lived across the street from a park growing up, and he began playing baseball at 5 and coaching at 16. 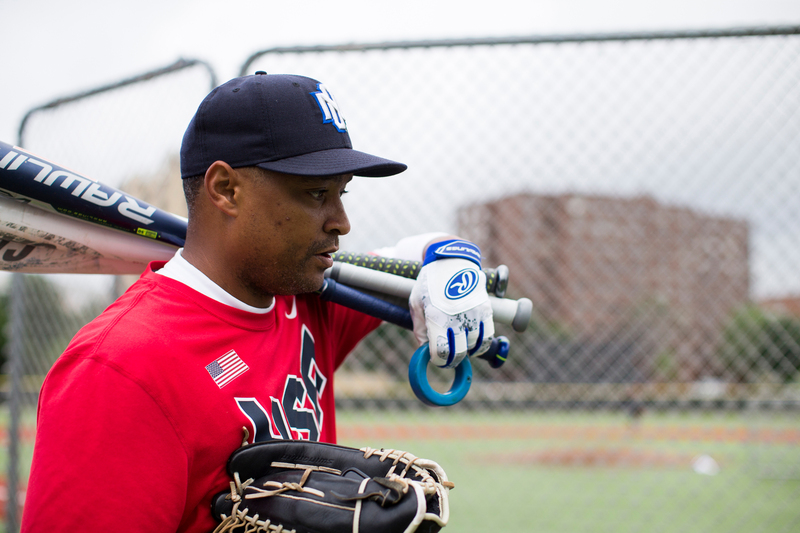 He never played travel baseball because “my family just couldn’t take off to go all kinds of places to watch me play.” He played in high school and for three years at Morehouse College, which he attended from 1991 to 1995. Congressman Cedric Richmond (D-LA) carries gear after practice. 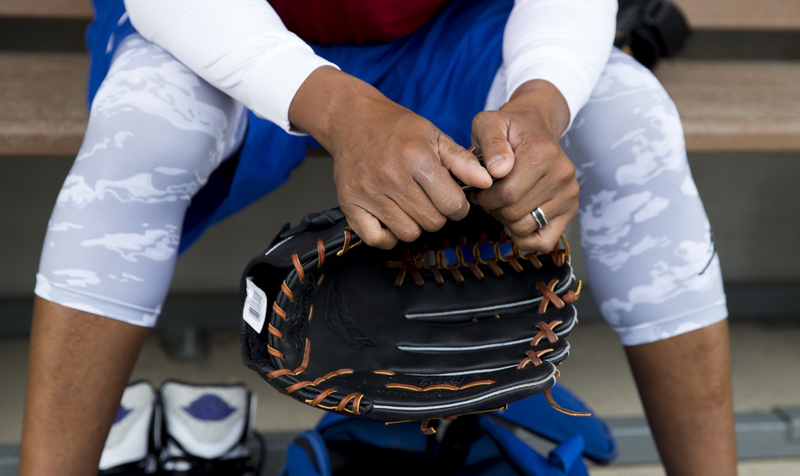 Congressman Cedric Richmond (D-LA) holds his glove while sitting in the dugout during practice. He calls historically black colleges and universities (HBCUs) a primary incubator of baseball talent but says they have challenges. “Baseball isn’t a moneymaker for HBCUs, so they don’t invest the type of money in the program that they should.” He played with a club team his first year at Morehouse, and the school had an official team his second and third years. His fourth year, the school cut the baseball program altogether. It’s since been restored. He started coaching Little League while he was a student at Tulane Law School and used his financial aid money to buy equipment and uniforms. He continued coaching while a Louisiana state representative from 2000 until he joined the U.S. House of Representatives in 2011. He was elected CBC chairman last November, and while he no longer coaches, he still mentors young athletes. 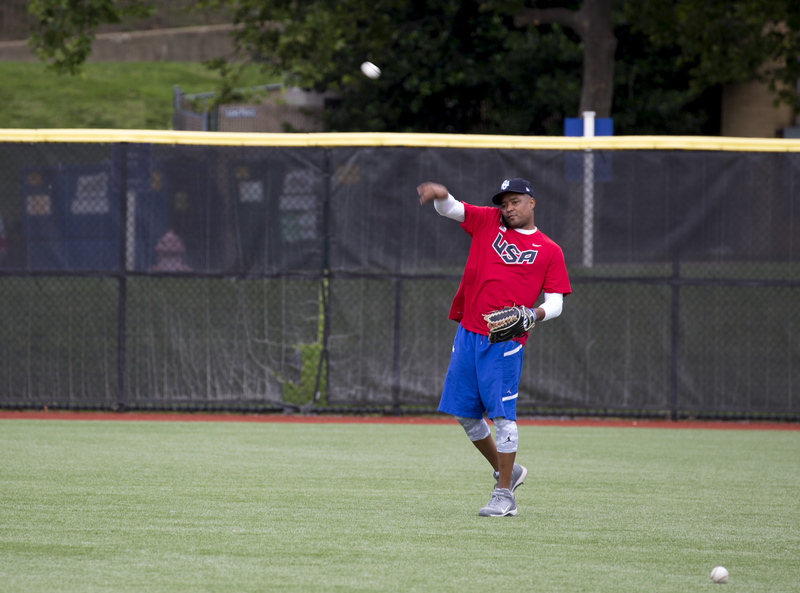 Truth be told, even the youngest and most athletic legislator in Congress is still past his prime on the baseball field. But last year, Roll Call speculated that Richmond might be the best congressional player ever, with Pro Football Hall of Famer and former Oklahoma Rep. Steve Largent also mentioned in the same breath. Richmond used to throw an 85 mph fastball. Now, he jokes, whether he’s throwing fastballs, changeups or curveballs, he mostly just tries not to hit anybody. He plays more golf than baseball these days and has played in charity games with other members of Congress. Recently, more nonblack players have helped fill the ranks of HBCU baseball teams, with white scholarship players outnumbering black players in the Mid-Eastern Athletic Conference. The number of professional players is stagnant as well. When Jackie Robinson’s major league career ended 60 years ago, 6.7 percent of players were African-American, and today it’s 7.7 percent. Baseball requires green space, bases, bats, balls and gloves, which makes neighborhood pickup games — which need between six and 20 kids — harder to come by, Richmond says. And black kids today haven’t grown up watching multisport superstars such as Bo Jackson and Deion Sanders, who both played professional football and baseball. “They didn’t grow up seeing Ozzie Smith or Reggie Jackson or Dave Winfield,” Richmond said. He’s hopeful that Major League Baseball’s creation of Urban Youth Academies, an initiative to encourage baseball in urban areas, will help effect a turnaround in the game he loves. At one point during last week’s practice, Richmond headed out to center field but had to take a phone call. When a long fly ball sailed his way, he casually plucked it out of the air, apparently without a break in his conversation. Congressman Cedric Richmond (D-LA) throws back a ball that he caught while taking a phone call in the outfield. 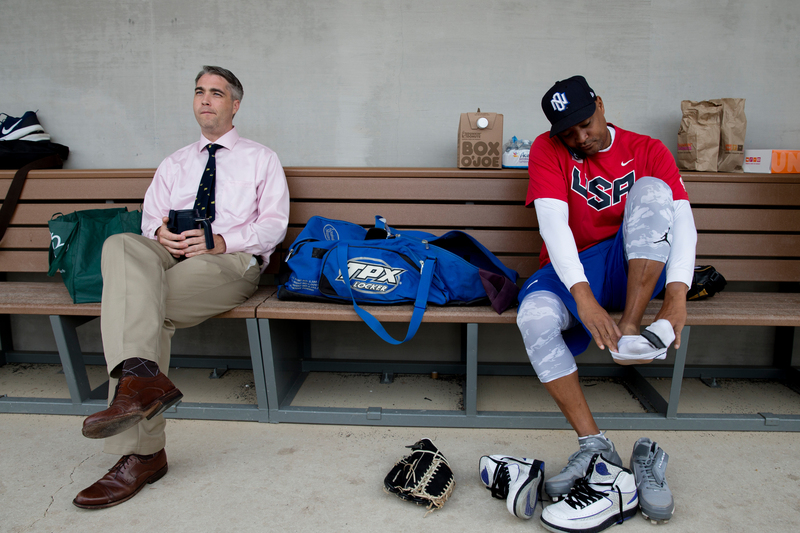 Richmond’s teammate Rep. Hakeem Jeffries (D-New York), who played baseball in high school, is an admirer. “He inspires confidence in all of us,” said Jeffries. An early morning shooting at a baseball field made that one of the game’s highest stakes.